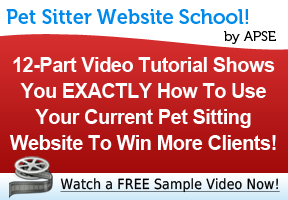 Market Your Pet Sitting Business Better! 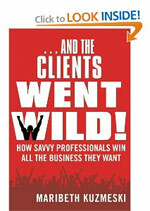 Win a free copy of Maribeth Kuzmeski’s book, “…And the Clients Went Wild!” (read about it on Amazon)! “How is your pet sitting business different than all others?” OR Why should a new client hire you over all others? Winner will be announced on Sunday, October 17, 2010. My pet sitting business is different from all others because I offer special services for schutzhund ring dogs. While most schutzhund trained dogs are all owner focused, sometimes their owners have to leave and can’t be there all the time. I carry on the special needs of these dogs, as well as keep up with their training so the owner can return home to a dog that hasn’t been set back. My biz is different because I can walk any dog in a heel which includes aggressive dogs and dogs with zero leash manners. I developed a method that is easy,gentle, safe and effective. I also teach my method to the owners so so they can learn how to walk their own dog and not be scared or embarrassed to walk their dog in public. Being able to walk and pet sit for crazy dogs allows their parents to actually go on vacation also because these are the type of dogs that boarding facilities,doggy daycares and your average petsitter WONT take for liability reasons and because they just cant handle them. Great interview Josh! As I ponder how my business is different and how to tell the clients what is different about me this is what I come up with…. 1. In addition to offering specialized services for medically needy pets and in-home pet hospice services, I offer a compassionate approach to each and every pet I see that respects the individual being not only on a physical level but on a spiritual level as well. I want the client to know that in addition to my specialized experience and training, each time I enter their home, I look beyond the physical needs of the pet to see them at a deeper level. Are they content, happy, lonely or maybe in need of more than a clean bowl of water and fresh food? There is a special bonding process that happens with each pet under my care. And I reflect this care in the way I try to address the specific needs of each animal. I respect them as a sentient being with feeling and emotions that must be addressed. Then I do everything I can to let the client know that there is nothing more important to me than THEIR PET. I take extra time to write detailed notes of every visit sharing all of the details of how we played,cuddled, or of something cute of funny that happened. I also write about the evolution of our bonding process and how the pets respond to me that may be different from the previous visit or since the last time I saw the pet. 2. When I developed my policies I did so with the intention to every detail so that the client would be comforted by the fact that they would feel their house was safe and secure while I was there. It’s a huge, huge thing for a person to turn over the keys to their house to a stranger so I let every new client know of the extra attention to detail I take to ensure the safety of their home as well as their pet. This starts with extra precautions for key security both at the office and when I am in the field. Attention to details also include 90-minute to 2 hour initial consults and taking the time to not only get to know my clients on a personal level but to observe the pets in their home environment so I can better recognize if something is “off” or if their pet is not feeling well. And this extends to even keeping tabs of litter box behavior and eating/drinking habits. (Has the cat pooped today? What is the consistency of the poops? Is their excessive urination? How much water is being consumed?) There have been times when I have noticed changes in a client’s pet that the client does not even notice because they are there every day and may be distracted. Potential clients seem to want more than someone popping into the house and dropping food into a bowl and scooping out the litter box. 3. Finally I let them know that my business model is set up to meet the needs of the pets under my care not my own convenience. I think this is a huge difference. For example, I am the only pet sitter in my area to offer night visits for indoor only dogs. Yes, I am out late sometimes to 11p and up again and out by 6a but I feel it translates to very loyal clients and in this economic climate that is what is important. This is only a snippet but I hope offers some insight to what I try and accomplish. My challenge is turning this into positive marketing which is oh so often so hard for me. Thank you Maribeth for reminding me that it’s the stories that are important! Thank you Ryan, Sarah, and Lauren for sharing your stories with us so far! I am thrilled you are getting the hang of this and see the value and importance of it. As noted, this all comes down to MARKETING – Something we strive so hard to achieve and ‘get right’ every day. I can’t wait to read more and see how this does translate into more clients for you! You make good points Joshua. I am a good at training dogs how to walk on leash so I should point that out during my next interviews and advertise that on my website. I can offer that as a service. I’d also might like to include training basic commands and pet massage. Why GCPS versus other pet sitters: The owner of Gold Coast Pet Sitting is trained in Pet CPR and First Aid thus allowing you the peace of mind that the team-members have someone on hand for any situation from minor ant bites to how to deal with choking or heat stroke. The other benefit to using GCPS versus other pet sitters is that we are able to communicate with you about the care of your loved family members in a myriad of ways: facebook, twitter, skype, sms, email … this means that even if you go overseas: we can still be in contact with you. The final benefit of being a client with GCPS is how we offer an email newsletter, facebook pages (communities), linkedin page and any number of ways that YOU like to keep “in contact” with us (and vice versa). We try to provide you, the client, with a sense of community with our business. We DO care. We always will. Unlike a vet nurse (click here for one person’s experience), we will never be cold and see your pets as “just a dog/cat/rat”. To us they are petizens – pet citizens. I really enjoyed the interview and learned quite a bit. My pet sitting and dog walking business is different because I am a Veterinary Technician (a vet nurse) and I take pride in the fact that I have 15 years of animal experience working in small animal clinics, because of this I know more than the average person about the care of pets, I am educated in diseases, first signs of illness, emergency situations, etc.. and have had hands on experiences dealing with all kinds of situations such as seizures, hit by cars, dog fights, geriatric pets, pets not breathing, the list goes on and on. We can all take pet first aid classes and I think if your in this type of business you should and it should be a requirement but I think that the fact that I have actually dealt with emergencies face to face is a huge benefit to our clients and was a little offended by the comment made by Vanessa that a vet nurse is cold and treats pets as “just a dog/cat/rat” just because one person is like that does not mean we all are. I treat every pet as if it is my own and so do the people who work for me. I have many clients that use our services because of the fact that I am a Veternary Technician and I am able to care for their sick, elderly, or handicapped pets that they would not want to put in a boarding facility. Everyone that works for me knows that if there is a situation with a pet they are caring for all they have to do is call me and I will be there to help or if it’s something minor give them instructions on what to do. Even if it is a minor issue I will stop by and check on the pet myself during my day. I have gotten wonderful feedback from clients, many who have not been able to go on a vacation or even a day trip because they were afraid to leave their pet. They continue to use our services and enjoy the freedom they now have. One other thing I offer to my clients is my home phone number. They know that they can always get a hold of me to check on their pet anytime and if they need a last minute service I am always available. In some ways I think that is an even better way to communicate than facebook, twitter, etc.. it’s more personal and when a client can hear your voice telling them about how their pet is doing is very reassuring that things are going well. A very proud “Vet Nurse” in MN. MJC – I am not aiming at you personally please do not be offended. I’m just saying what has been said to me (as well as what I have read on various forums) by people in re: their experiences with vet nurses. Use that as your selling BENEFIT (not feature) that you love the pets as well as being able to offer the pets the best care they could receive because of your animal care knowledge/experience. It’s not about you. It is about the client. You need to assure them you won’t be cold and do have actual knowledge. There are vet nurses who have no idea about dog training/behaviour, how to properly walk a dog on leash, and are cold. Well thank you so much for your reply, it shows that you are a good person and you genuinely care about people and pets. I’m just curious are these forums from Australia or America? I’m just wondering what if any are the differences in vet nurses here compared to vet nurses in Australia. I would love to be a vet nurse in your country what anamazing variety of pets to learn about.I agree that there are many people in the Veterinary Technician field that do not know about dog behavior or how to properly walk a dog but that can also apply to a lot of people who try a pet sitting business. Either way you shouldn’t promote what you don’t know or have experience with. Which is the reason I think many of these business’s fail. I have had great success with our business and hope to continueto do so. My first priority is always the pet and I always reassure our clients. Thank you again for responding to my comment and I wish you all the success you strive for. who have been in foster care most of their lives. WHILE YOU”RE AT WORK OR ON HOLIDAY, PROVIDING YOU PEACE OF MIND! WELCOME TO CALL JOSEPHINE PET SITTING SERVICES! we look forward to meeting with you and providing the RIGHT CARE for your precious family member! 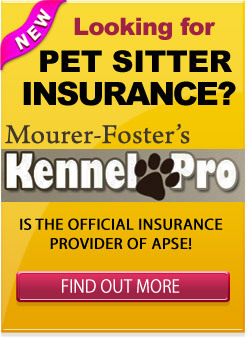 INSURED, PET FIRST AID & CPR CERTIFIED, and MEMBER of the ASSOCIATION of PET SITTING EXCELLENCE! CALL JOSEPHINE PET SITTING SERVICES IS NOW ON FACEBOOK! I feel that my services and personality, allow me a uniqueness with both the pet and the client. I have raised every type of animal,(including wild) and have an ‘animal magnetism’ and deeper understanding of all animals, than most. This allows me access to pets that others may not be able to get close to. An owner will see this and feel comfortable that I would be able to handle any situation that may arise, or just simply be an exemplary person to be with their pets. My studies in Veterinary Medicine, are expanding my knowledge for providing medical attention. Clients trust me. Bonded and Insured. This was a great interview! Thank you so much for sharing. It has definitely gotten my mind thinking in a different way. I think what sets me apart from my competitors is my compassion and thoroughness. I always try to understand exactly how my clients feel about their pets and I am very thorough. I check their pets for things that they may not know how or what to look for. My clients always feel secure knowing that I am pet sitting for them. They know they have nothing to worry about. I was so inspired by this interview, that I decided to make a video montage about “Why Hire The Pet Depot?” and soon have it on my homepage. 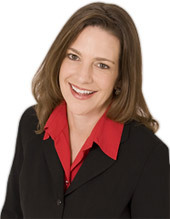 Here is the link to my video http://www.thepetdepot.net/video.cfm that explains what makes my business different than others. Thank you for the interview and I look forward to hearing more at the conference. Thank you all for leaving your comments on this post. Congratulations, Josephine, I’ll be in touch shortly. 1. We are here for your animals and when we are with your pets they are our main priority. 2. I bring with me many years of dealing and caring with different types of pets and feel confident in taking care of your pets as well. 3. I am presently looking to bring to my clients the opportunity of supplying tranportation to and from appointments, should it be necessary for my home bound clients. 4. Our business is making your pets our main priority when we are with them. We can supply care for them from birth to passing away and all the time in between.